This week we celebrate the Annunciation, moved from its usual commemoration on March 25th to March 31st due to our extraordinarily early Easter. To reflect on Mary’s visit from the angel Gabriel is to reflect on the power of a mother’s “yes.” She was a young woman who had no idea where her “yes” would lead her. She could not envision the trip to Bethlehem or giving birth among the animals. She could not hear the words of Simeon in the temple, “A sword will pierce her heart.” She could not imagine fleeing to Egypt in order to save the life of her child, or the fear of thinking her child was lost as she and Joseph searched the streets of Jerusalem frantically for him. In her worst nightmares, she could not have pictured the pain of the cross. In her wildest dreams, she could not have experienced the glory of the Resurrection. And yet, she said “yes.” She said “yes” because she knew it was God’s will and she was a faithful Jewish woman who lived to do God’s will. In a similar, although certainly not so dramatic fashion, each mother says “yes” to the gift of an unborn child. While we generally get the news from a home pregnancy test or a doctor rather than an angel, we each say “yes” to an unknown future. We can’t even imagine the unique road that each child will travel and that we will journey with him or her. We say “yes” to both the joys and pains of motherhood. We say “yes” to first words and first steps and loving hugs and graduations and weddings. We also say “yes” to sleepless nights and temper tantrums and illness and teenage angst. We say “yes” to loving even when we don’t actually like our children. We say “yes” to loving even when our children reject us. Mary’s “yes” allowed salvation to come to the world. Our “yes” also changes the course of the world. Each child leaves an indelible mark on our own lives and the lives of all those that they will touch. An unborn child comes from God with a purpose to fulfill, an irreplaceable role to play in history. Mary’s life was changed forever by her “yes.” In a moment, she became an unwed pregnant woman, a fate punishable by death in the world in which she lived. But she trusted that God had a plan; that somehow it would all work out for good. We can learn so much from Mary’s trust. We need to trust in God even when our parenting journey is filled with difficulty, even on days we don’t know how we are possibly going to make it through the day. We need to remember that our children are God’s children first. God is with us to help us bring them up. We need to trust that God has a plan for both our children and for us. Indeed, a mother’s “yes” is a powerful affirmation. This week, let us be thankful for Mary’s “yes” as well as the “yes” of each mother since the beginning of time. Let us be thankful for both the invitation to motherhood and the gift of our children. Let us rejoice at being able to be part of God’s great creative plan. I just completed reading Introduction to the Devout Life by St. Francis de Sales (patron saint of writers.) This is by all accounts a spiritual classic. Originally written in 1609, it was unique in that it was directed to the laity at a time when most felt serious spiritual work was the domain of priests and religious. He does not profess to be a spiritual master, but rather one on the journey as well, claiming that "the office of teaching serves as a foundation for learning." As a writer on spirituality myself, I can definitely relate to this. I am far from perfect and there is much I struggle with, but as I read and do research and pray and work out my ideas on paper to share with you, I find that I am learning much as well. Many people went to Francis de Sales for spiritual help. This book grew out of his spiritual care for souls. Of course, 400 years later, some parts of The Introduction to the Devout Life do seem very anachronistic. He refers to practices and medical procedures we consider primitive today. In many ways, however, humanity has not changed. We still experience the same temptations. We still struggle with the same distractions. We still desire to be close to God. St. Francis de Sales holds believers to a very high standard, a standard which many would no doubt deem unattainable or unrealistic. But Jesus was the first one to set that standard: "Be perfect as your Heavenly Father is perfect." The truth is that none of us are perfect, and de Sales acknowledges that. We will always struggle with venial sin. The point is that we should be trying to be perfect. It is a journey and a struggle, but we need to keep putting one foot in front of the other. When we stumble, we need to get up and try again. The world vilifies holy devotion as much as it can. It pictures devout persons as having discontented, gloomy, sullen faces and claims that devotion brings on depression and unbearable moods . . . the Holy Spirit by the mouths of all the saints and our Lord by his own mouth assure us that a devout life is a life that is sweet, happy, and lovable. The work of purging the soul neither can nor should end except with our life itself. We must no be disturbed at our own imperfections, since for us perfection consists in fighting against them. You must not only cease to sin but you must also purify your heart of all affection for sin. Consider that it is strictly true that you stand between heaven and hell and that each of them lies open to receive you according to the choice you make. . . .God desires you to choose heaven. Do not hurry along and say many things but try to speak from your heart. A single "Our Father" said with feeling has greater value than many said quickly and hurriedly. In confession you not only receive absolution from the venial sins you confess but also great strength to avoid them in the future, light to see them clearly, and abundant grace to repair whatever damage you have incurred. Complain as little as possible about the wrongs you suffer. Undoubtedly, a person who complains commits a sin by doing so, since self-love always feels that injuries are worse than they really are. Love everyone with a deep love based on charity, but form friendships only with those who can share virtuous things with you. A friend who would lead us into sin has become our enemy. Beware of falsely imputing crimes and sins to your neighbor, revealing his secret sins, exaggerating those that are manifest, putting on an evil interpretation on his good works, denying the good that you know belongs to someone, maliciously concealing it or lessening it by words. As soon as you are conscious of being tempted . . . turn to God and implore his mercy and help. This excerpt from today's Gospel (Luke 24:13-35)is one of the strongest pieces of evidence we have for the truth of the Resurrection. The first witnesses were women! Women were not exactly held in high esteem back in 1st century Palestine. Some over the centuries have claimed that the Apostles made it all up. This is unlikely in itself because the Apostles were scared out of their mind and the vast majority of them fled the scene of the crucifixion and were doing everything in their power not to be associated with Jesus. But, just for the sake of argument, let's say that they did get together to make this story up. Never would they have had women be the ones they based their story on. Women were not considered credible. Perhaps this is one more illustration of the special love Jesus had for women. He treated women with an equality and respect that were almost unheard of in his day. When he returned in his glory, he let the women know first and sent them as messengers to the men. Women were entrusted with spreading the greatest news of all. Jesus told St. Faustina that this Feast of Mercy would be a very special day when “all the divine floodgates through which graces flow are opened”. 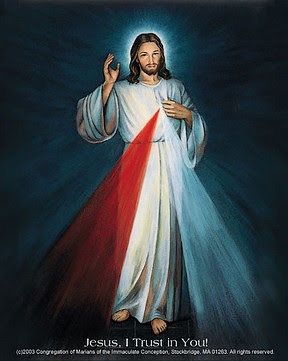 (Diary 699) Our Lord made a great promise to all those souls who would go to Confession and then receive Him in Holy Communion on the Feast of His Mercy, now called Divine Mercy Sunday throughout the Catholic Church. It is required of all Catholics to confess their sins at least once every year. If you haven’t had the opportunity to meet this obligation then take advantage of this wonderful opportunity to receive an outpouring of an ocean of graces that Jesus promises. Those who have already confessed sins for Easter could make room for others. It is allowed for one to go to Confession up to about 20 days, before or after Divine Mercy Sunday. Patrice Fagnant-MacArthur will host a workshop about the Art of the Blog at the first annual Catholic Writers’ Conference Online, May 2-9, 2008. The conference, sponsored by the Catholic Writers Guild and Canticle Magazine and conducted entirely through the Internet, is free of charge and open to writers of all levels. It will feature online seminars, chats, and forums throughout the week on a variety of topics covering writing both fiction and non-fiction, submitting manuscripts to publishers and marketing your books--and yourself. Over 20 workshops are scheduled with more still in the works, according to coordinator Karina Fabian. The Art of the Blog will help writers take the plunge into blogging. It will provide information on how to set up a blog, what to write about, how to market your blog, and how to make money from your blog. Fagnant-MacArthur joins top names in the Catholic publishing industry and other skilled presenters, including: best-selling authors Donna-Marie O’Boyle and Tom Grace; editors Heidi Hess Saxton (Canticle), Vinita Hampton Wright (Loyola Press), Ami McConnell (Thomas Nelson); agent Terry Burns, and marketing experts like Carolyn-Howard Johnson. Early registration is recommended, as some courses will have limited openings that will be filled on a first-come, first serve basis. Donations are accepted; proceeds will go toward future conferences. To register or for more information, go to http://www.conference.catholicwritersguild.org. With Easter being so early this year, the weather here in Massachusetts was positively cold. While there are a few daffodil and tulip sprouts poking their heads through the ground, the grass is still brown, there are still patches of dirty snow in some places, and we still need to wear our winter coats. It really doesn't feel like Spring. And yet, the promise is there. It is coming. We know it is. The sun is brighter. The days are not so bleak. We just need to be patient and endure these last days of cold. For many of us, perhaps this was a "not yet" kind of Easter. The promise of Resurrection and New Life is there, but we can't quite feel it yet. Our lives are still stuck in the muck of winter, long after the snow has ceased to be beautiful. But we trust that the glory is coming. We believe and we hope. Sometimes, that is all we can do. I wish all of you a very blessed Easter! Him in His risen life. Grant this through Christ the Lord. We live in a world where "going with the pack" is not only acceptable, but encouraged. People do not like it when someone does or thinks something that is different or "out of the box." I think it's because they are afraid. They are afraid of what they don't know. I have always wanted to be an independent thinker. I want to do, be, and think the right thing - whether or not the rest of the people around me are doing, thinking, and being it as well. Of course I would prefer it if they were - but if they are not, it is more important to me, that I use the brain that God has given me to do the right thing. Sometimes that's really hard. When I was in a Family Health class in high school, our teacher once asked us to divide up into groups. He asked us to move to one side of the room if you thought living together before marriage was okay, move to one side of the room if you thought living together before marriage was wrong, and to stay in the middle if you were unsure. I was the ONLY ONE who thought living together before marriage was wrong. That was hard for me. It wasn't hard for me to admit what I believed, but it was hard for me to stand up for it in front of my high school peers. But I did. And it felt really good. After class, I remember someone came up to me and they told me that they really respected me for standing up for what I believed in. I have never forgotten that. It could have been so different if I had chosen to conform to what everyone else was thinking or doing. As a parent, I want to teach my children to be independent thinkers. I want them to not simply blindly trust what is told to them, but to use their brains to think about it. I want them to learn how to problem-solve. Do you know that a lot of store clerks these days do not know how to truly help a customer because they don't think about it? They simply go with store policy or read what is on the tag. Well, I could have done that! They don't know how to look at a situation or dilemma, use their brains, and come up with a solution. I've had it happen to me time and time again. We need to teach ourselves to be independent thinkers so that our children can learn to be, as well. We need to remember that although everyone else in our city may vote for one person for President, or think that one movie is really okay to see, that they all may be wrong. Because a lot of people go with the pack instead of thinking things through for themselves. It's a big part of why our society is on a downward spiral. It may be hard to encourage your child to stand up and take a stand for a different viewpoint or action, and at times, you or your children may even be blasted for it in some way. But it's worth it to know that you are using your brain and your heart in a way that the Lord would condone instead of simply letting your brain muscles sit there - unstretched and untapped. Be an independent thinker. You may just make a difference. Amber is a student. Green. Still learning. I'm not sure if she's ever yet done an assisted shower. But she proceeds seemingly with no thoughts for herself. She seems to get inside my skin and know exactly what is needed as though she is me. Her empathy takes on a spirituality I hadn't expected. . . I feel reborn. Tears surprise me and begin flowing down my cheeks, and I hope Amber doesn't see them as they mix with the shower spray. . . I finally look askew at her and see that her white uniform is absolutely wet. "You're drenched. I'm so sorry." Amber smiles. "Don't worry about it." I stare at the floor of the shower and see that her tennis shoes are also squishy wet. I worry about how she'll get home. It's the middle of February in Minnesota and below freezing outdoors. "Shush," she whispers and keeps washing and rinsing. It is a warm blessing I never want to end. Begnaud was so touched by her experience with Amber that she wrote this article as soon as she got home from the hospital. She sent it to the College of St. Katherine where Amber was a student as a way of saying "thank you." The college then contacted her in order to use the article in their teaching program. They also shared Amber's side of the story. Student nurses have to evaluate themselves after encounters with patients. As Begnaud writes, "Amber had graded herself poorly after ministering to me. She had felt inept, had accidentally loosened an IV in my arm and caused bleeding and ultimately considered the experience a failure on her part." How many times in our lives do we try to serve someone but feel we did badly? We think over the things that we could have done differently, and often feel like a failure. We rarely know what our kindness has meant to someone else. Sometimes what we feel is our greatest failure may truly have made a difference in someone's life. Is it possible for our Catholic faith to transform our increasingly secular culture? 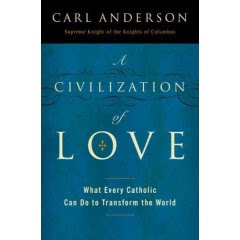 Carl Anderson answers that question with a resounding “Yes!” in his new book A Civilization of Love: What Every Catholic Can Do to Transform the World . Anderson is the leader of the Knights of Columbus, the world's largest Catholic fraternal group. He has worked closely with both Pope John Paul II and Pope Benedict XVI and has served on several Vatican committees. In “A Civilization of Love,” he relies heavily on the teachings of Pope John Paul II and Pope Benedict XVI, especially the theology of the body and Pope Benedict's recent encyclical Deus Caritas Est (God is Love). Anderson focuses on the ways we can serve in our families, our workplaces, and in the global economy. He discusses many of the social ills that face Catholics and the world today such as the breakdown of the family, the reality of abortion, the increase in working hours, the loss of the Sabbath rest, the need for more ethical behavior in the workplace and government, and adjusting to a changing Church. He offers concrete ways Catholics can make a difference. Catholics do have the power to transform the world. “They will do so by their actions, by their attitudes, and by their influence. But above all, they will do so by their love. This love is a matter not of mere high-minded sentimentality but of genuine compassion tempered with a well-grounded realism. It is a love that offers hope not only for eternity but for a better way of life on this earth.” “A Civilization of Love” invites us all to be part of that transformation. It is up to us to answer the call. Many men, women, family members and friends are seeking to make sense of their own or a loved one’s abortion experience. You are not alone. Abortion Changes You is an invitation for those who have been touched by abortion - men, women, grandparents, siblings, other family members and friends - to know that they are not alone and that healing resources are available. Men and women are able to type in their Zip code and find local resources such as after abortion ministries and counselors. The outreach includes the interactive Web site AbortionChangesYou.com and the book Changed. The Abortion Changes You outreach is close to my heart because I’ve been there. I experienced periods of intense anger followed by periods of profound sadness. With counseling and the help of supportive friends, I was able to enter into a healthy grieving process. In addition to grieving the loss of my child, I slowly became aware of how my choice to abort had impacted my family. I was surprised and saddened that my parents, my sister, and even my living children struggled to deal with the loss of a family member through abortion. Over the years I’ve heard many heartrending stories about abortion. Although each story is unique, a common thread moves through them all—abortion changes you. Although abortion has touched many of us, we rarely share our personal experiences regarding it. This is what led me to write a book that shares some of the stories I’ve heard. Changed: Making Sense of Your Own or a Loved One’s Abortion Experience is an invitation to begin the healing process through a grief and loss healing model. There was also a need for a safe space for people to tell their stories, explore the ways abortion has impacted them, and find resources. We created AbortionChangesYou.com to fill this need. It is my hope that the Web site and book will assist you as you seek to make sense of your abortion or the abortion of someone close to you. If you have not been touched by abortion, I hope that the Web site and book will aid you as you seek to sensitively and compassionately communicate with others about abortion. View the 1-minute video about the outreach here. The biblical portrayal of Jesus suffering in the Garden of Gethsemane shows Jesus in one of his most human moments. He knows the horrors that await him and he is scared beyond belief. He has just shared the Passover meal with his friends. He has instituted the sacrament of the Eucharist. He has established the priesthood to carry out his work after he is gone. He has sent the one who was to betray him away to fulfill his task. His earthly work is almost done. And now he sits alone in prayer. The disciples he asked to accompany him have fallen asleep, their bellies full and their bodies tired (would we have done any better?). It is just Jesus and his Father in heaven, and Jesus is begging his Father to let him off the hook. He is ready to do his Father’s will, but he really wishes that there were some other way. We all have our own Gethsemane’s in life, times when the future looms heavily before us. We all have those times when our friends have deserted us, or at least it feels that way, and we are alone in our suffering. We search for comfort and there is none. We look for some way to avoid the pain and there is no alternative plan. When we are in our hour of need, it is good to remember Jesus in his. Jesus knows what it is to be alone and hurting. He knows what it is like to face a painful future. He knows what it is to be scared. He knows what it is to beg our Heavenly Father and be told, “No, I’m sorry. This is the way it has to be.” We have a God who knows what it is to suffer. Jesus’ suffering had a purpose – the redemption of the world. He died so that we might live. The mental anguish of his night of agony and the physical pain of his torture and crucifixion were necessary to triumph over death. It sets the stage for the beauty and power of the Resurrection. Our suffering has purpose as well. Often, we can’t understand the reasons for it, and like Jesus, wish it could be some other way. God doesn’t want us to suffer, but sometimes he allows it in order to achieve some greater purpose. We need to go through our own Holy Thursday, Good Friday, and Holy Saturday trials in order to experience the glory of our own Resurrection triumphs. It is interesting to note that when Jesus appeared to his friends after his Resurrection that they did not recognize him at first. He was different somehow. This hold true for us as well. When we have gone through some great trial in our lives and we come out on the other side, we too have been changed and transformed. We are not what we once were. In life, we all have our own agonies in the garden. Like Jesus, we are scared and feel alone. Will we also follow Jesus’ example of trusting in God’s will even when the cost is so high? Will we accept the suffering as a means of bringing us to our own Resurrection moment of transformation and glory? One of the most frustrating problems that I had working in "Blogger" - the software provider that I use to create and host this blog, was that I couldn't post-date a post. So, if I wanted to post something for a week from now, I had to physically log in and post it that day, which was not always convenient. The regular panel for Blogger would allow me to put in a later date for a post, but if I hit publish, the post would immediately appear on my blog - it would just have a later date. In the event that other Blogger users out there have struggled with the same issue, there is a way to post-date your posts. Instead of logging into Blogger at www.blogger.com, use http://draft.blogger.com. Then you can use your publishing options to input a later date, hit "publish" and the post will be published on the day that you want it to be. I can't even begin to tell you how much easier this has made my life, especially when it comes to posting on my Moment of Beauty blog where I create a post for each day! 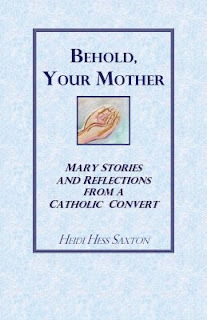 As a Catholic convert, Heidi Hess Saxton had to learn to have a meaningful relationship with Mary, the mother of Jesus. In Behold Your Mother , she shares her "own story about how [she] came to regard Mary as [her] own spiritual mother, and reflect upon her earthly life as well as her heavenly vocation." As an adoptive mother, Saxton feels very connected with Mary's role as our adopted mother. Jesus gave Mary to all of us as our mother while he was on the cross. Some respond to this motherhood quite naturally. Many of us, especially those raised as cradle Catholics, can't imagine not thinking of Mary as our spiritual mother. Others, such as Saxton, need to be invited into that relationship. In the first part of "Behold Your Mother," she shares how she came to know and love Mary. Saxton compares it to when she was first caring for her foster children. As painful as it was, she had to wait for them to come to her before they could forge a bond. Saxton states that Mary "waited for me to express my need . . . such as someone to sit with me in Church when I was feeling lonely, or safety for my children and me in a time of perceptible danger . . . and then found a way to fill it." The wind moaned, the straw prickled. and you dreamed of home. Did you wish for your mother? but you are mother now. pomegranates . . . and, I could weep from sheer frustration. "Behold Your Mother" was written for those just coming to know Mary, but it is a wonderful source of reflection for those of us who already love Mary and turn to her as our mother. It is a brief book, but it is full of meaning and value. It is a reminder of the importance of Mary in God's plan for salvation, as well as her role in our lives. Jesus followed the commandment to "Honor thy mother and father." He wants us to honor our adopted mother. Through honoring Mary and forging a relationship with her, she brings us to her divine son. 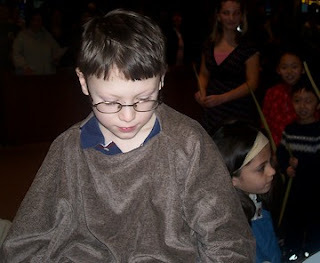 My son David had the honor of being Jesus in the Palm Sunday pageant this morning. It is always a little nerve-wracking to watch your child have to perform in public, especially when the whole congregation is looking on, but he did a good job and rode the pretend donkey with grace! 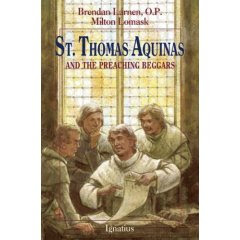 The boys and I are reading "St. Thomas Aquinas and the Preaching Beggars" which tells of the life of Thomas Aquinas, perhaps the most learned Catholic theologian of all time. Yet in class with his professor, who would also become a saint - Albert the Great, he was very quiet. Most of the other students thought he was a little slow in the head. In fact, they called him the "dumb ox." Until one day in class, Thomas explained a difficult problem, and Albert the Great claimed that "the dumb ox's bellow would one day be heard around the world." In a cursory search, I wasn't able to find what the problem actually was. According to the book we are reading, however, it regarded the following logic problem. We know what a human being is. A human being is defined in the catechism. A human being, according to the catechism, is a creature made in the image and likeness of God and endowed with a soul. In short, a human being is a child of God. That is the only essential thing about him. Everything else is accidental. Whether his voice is high-pitched or low-pitched, that is accidental. The color of his skin, the color of his eyes, where he was born, or how rich his parents are - all those things are merely accidental. The only essential thing about a human being - the only thing that matters - is that he is a child of God! I don't know if these were Thomas' exact words although it does sound like something he would say. In any event, I think that is a wonderful definition of a human being. 1) For a very dear friend of mine who is experiencing some physical and mental health problems. 2) For someone whose father is dying. He asked if I could pray and ask others to pray the Divine Mercy Chaplet for his soul. Instructions on how to pray the chaplet can be found here: http://www.spiritualwoman.net/Prayer/DivineMercyChaplet.html It is a wonderful prayer to be said anytime, but especially when someone is near death. It can be difficult for children to persevere when the going gets tough. Telling them to "try, try again" or that "practice makes perfect" is good advice, but sometimes a story can get a message across in a way our own words don't seem to be able to. 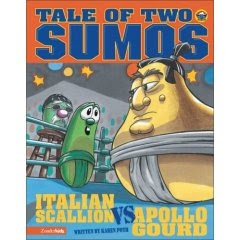 Tale of Two Sumos is a great story about a sumo wrestler named the "Italian Scallion" who has to go up against a very scary and big competitor, "Appollo Gourd." At first, Italian Scallion is training hard, but he isn't known for following through on what he sets out to do. All too soon, he gives up because "it's just too hard." When he sees himself through the eyes of his young friend Hadrian, however, the Scallion knows he has to return to his training. I won't tell you the ending, but the lesson of perseverance is there. As the book states, "He learned that God wants us to finish what we start even when it is hard to do. The Italian Scallion learned to persevere." Come to think of it, that is a good lesson for us adults as well. It is amazing how after the cold of winter 47 degrees feels absolutely balmy. The snow is almost melted and little green sprouts are poking out of the ground. The sun is bright and warm and you can just smell spring. The boys were outside playing with their friend next door, riding their bikes and scooters and playing "red light, green light." It was so nice just to be outside breathing in the fresh air. 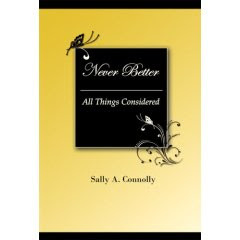 Never Better: All Things Considered is a collection of writings by Sally A. Connolly. Connolly is a retired school counselor and teacher. In 2006, she collected the writings of her late husband, Dr. Eugene Connolly into “A Boy from Lawrence” which met with high praise. This is Connolly's turn to write of trying to regain life after losing her beloved husband. Connolly had kept a journal in her youth, only to abandon it in the busyness of adult life. After her husband's death, she returned to keeping a record of her days as a means of coping with the profound change in her life. The teacher in her reared its head and she soon decided that she wanted to share her writings. As she states, “What good is knowledge or insight or opinions if you can't share them?” She timidly sent articles to the editor of her local paper. Before long, she was a contributing columnist and a writer was born. Connolly has some good advice to offer others suffering from a major loss in their lives. “Accepting widowhood, I have learned, can be made easier. By grabbing onto your skills and using them, you can begin to work through the crisis. So, to those just beginning their own journey of healing I say: Find an interest and launch a project. Paint a picture, sew a quilt . . . listen to your heart, treasure the good memories, and face the future with courage.” Writing was Connolly's project. The essays in “Never Better” run the gamut of topics, from her own childhood to parenting to music to encouraging success, to more local topics that Connolly wrote about for the Danvers (MA) Herald. While the more local topics do not have widespread appeal, there are some wonderful articles in the mix that speak to the universal aspects of life that we all share. Connolly even tells of a couple of miracles that have occurred in her family's life! “Never Better” will bring hope to widows that they can follow Connolly's example and keep going. Life does continue. While there will still be moments of hurt, joy does eventually return. To achieve success, thus, follow the lead set by the exemplars of excellence. First, look carefully at your interests and find something you are passionate about. Then, look realistically at the skills you possess as well as your potential for developing them or acquiring new ones. Rather than a headlong, helter-skelter dash, set a plan. Bolster your self-confidence by celebrating minor accomplishments along the way. Don't be surprised by setbacks, and don't be fearful of them. Detours on the road to success are only temporary glitches. Work through them and keep your eyes on the ultimate goal. Follow the roadmap you have set, enthusiastically devote time and effort, and visualize success. And finally, enlist the aid and support of family and friends. Telling them about your plans can help keep you on track. Most importantly, never give up." In the book of Deuteronomy, Chapters 6:9 and 11:20, Moses instructs the Israelites as follows: "Hear, O Israel! The Lord is our God, the Lord alone! Therefore you shall love the Lord, your God with all your heart and with all your soul and with all your strength . . . Write them (the words) on the doorposts of your houses and on your gates. Today members of the Jewish faith continue that command as you will find what is called the MEZUZAH on their home's doorposts. We Christians strive to carry out the Ten Commandments given to Moses by the Lord. Therefore let us also initiate Moses' practice of the MEZUZAH by placing on our doorposts the depiction of Jesus, our crucified Christ. Then, when entering or leaving the dwelling, touch the crucifix with your fingers and say a brief prayer. The small crucifix I received was a simple small plastic crucifix that had been blessed and had double-sided tape on it so that it could stick on the door. I put it up last night and the boys noticed it first thing this morning. I told them it was a reminder to say a prayer each time we leave the house. David said a prayer right away! It might be nice to send a small donation to him as well to help support this ministry. Easter is less than three weeks away! Typically, we can look forward to a sunny change in the weather. Gone is the gloom and hassle that can accompany the winter months. It is good that we look forward to Easter, but I suspect that sometimes we look forward to it for all the wrong reasons . . .
For some of us, we return to eating special treats, shopping, entertainment or, even, swearing. But, if your anticipation of Easter has more to do with these types of things than the Resurrection of Christ, you may want to use these last few weeks to go a little deeper in your Lenten reflections, because you've gotten off track! How does Christ's death and resurrection impact you and the way you live? Has the knowledge that Jesus suffered for YOU influenced the way you respect yourself and others? Do you love - truly love - unconditionally and first? Have you rearranged your life so that your work, family and play is inspired by your faith? When you look to Easter as a joyous day of celebration, do not plan to stuff yourself again. Do not plan to return to your old ways. Rejoice in the resurrection of Christ that has brought you new life. Then, and only then, will your experience in the Lenten desert have been well-spent. What happens after we die? From the earliest ages when a child first becomes aware of death, this question emerges. In talking to my own children (ages 6 and 5), they sometimes express a reluctance to go to heaven because their toys won't be there. I try to reassure them that heaven is the most wonderful place that they can imagine – better than the most perfect day here on earth. Yet, the question is natural, the reluctance is natural. For all the trouble that we sometimes confront in this life, it is familiar and comforting, and there are moments that are just amazing. Do we really have to leave? Do we really have to die? The prospect is scary. Regina Doman wrote a wonderful book, “The Angel in the Waters.” It tells of a baby inside the womb. The baby is happy and warm and has his angel by his side. Yet, the baby is reluctant to leave the security of the womb to visit the great big world outside. The baby asks his angel about the world on the other side. The angel responds, “It is not like this world . . . When you go there, you will find out.” After the baby is born and enjoying his new surroundings, the angel also promises that “there is another, bigger world outside this one. Someday I will take you there.” We don't remember our own births, yet I am certain that it was frightening. Those first gasps of air, those first cries, that ultimate protest shouting “I'm scared! Put me back in!” But then, there is the warmth of a mother's arms and a whole new bright world to explore. Dying is a second birth, an introduction into a world we can't even begin to imagine. What will be on the other side? Who will be there? What will we do? As we experience the death of loved ones, we wonder whether we will see them again. The world beyond is veiled in mystery, yet we believe that it does exist. We believe in heaven and hell and the purification of purgatory. We strive for heaven, yet wonder how heaven could possibly be heaven if we are separated from loved ones who have sadly turned away from God. We hope for the best for all who have died. We trust in God's mercy and pray for salvation for ourselves and for all people. And yet, we wonder. We do have some hints, some glimpses into the world beyond. We have the testimony of Jesus himself who spoke of eternal life. Jesus tells the story of the rich man and Lazarus (Luke 16:19-31). Lazarus is rewarded for his patient suffering in this life while the rich man had to suffer forever for his selfishness. In addition, Jesus promises the good thief on the cross, that “Today you will be with me in paradise.” (Luke 23:43). He tells his disciples, “In my Father's house there are many dwelling places. If there were not, would I have told you that I am going to prepare a place for you? And if I go and prepare a place for you, I will come back again and take you to myself, so that where I am you also may be.” (John 14: 2-3). The Catechism of the Catholic Church teaches that “This perfect life with the Most Holy Trinity – this communion of life and love with the trinity, with the Virgin Mary, the angels and all the blessed – is called 'heaven.' Heaven is the ultimate end and fulfillment of the deepest human longings, the state of supreme, definitive happiness.” Yet, in this communion, we do not lose who we are. We do not become absorbed into some great big energy field, or even into God himself. Rather, we continue to be who we are, but in a more glorified form. We even believe, that like Christ, someday our bodies will be resurrected as well because to be fully human is to be both body and soul. But these will be new bodies, perfect bodies, bodies without the aches and pains and diseases. We will be us, only better. We will understand. We will live in perfect harmony with God's will. It will all make sense. Yes, death is frightening. Like the baby being born, we would rather we didn't have to go away from the place we know and love. Yet, we trust in God's love and believe that what awaits us is far better than anything we have ever experienced.